Once you have wallaby.js installed and running in any of the supported editors, you may also use Wallaby.js App to get the realtime bird's eye view of your project's tests connected to your editor. After you have downloaded the wallaby.js plugin zip file, you can install the plugin by opening Settings - Plugins, clicking the "Install plugin from disk" button and selecting the downloaded ZIP file (or the unzipped JAR file if your browser automatically unzips the archive for you). After the plugin is installed, all updates are managed right from your IDE. Wallaby.js will notify you when an update is available. Once the plugin is installed, you may read the tutorial to get started. When you create a wallaby.js Run Configuration, it is recommended to use the node.js version selected by default. If you need to change it for some reason, just select the node executable that you would like wallaby.js to run with in the Node.js configuration field. 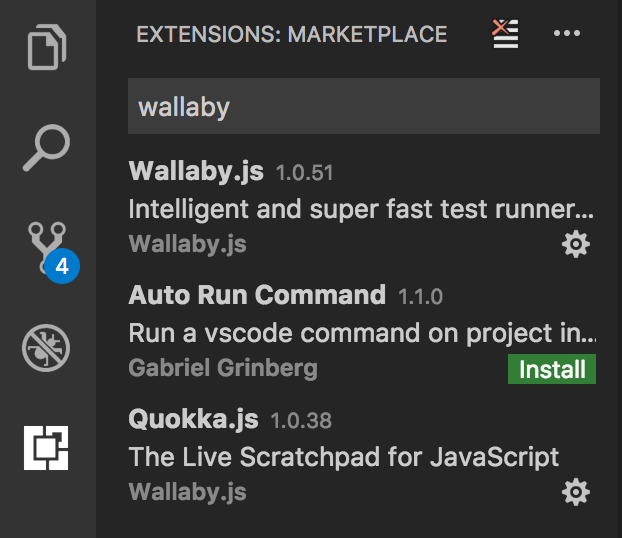 To get started, you need to install Wallaby.js Extension from your editor (using Extensions: Install Extension command or via the Extensions sidebar). After the extension is installed, wallaby.js Core will be automatically downloaded and installed. Please note, that the very first time wallaby.js needs to download and install its dependencies, so it may take a minute or two. Further updates are much faster. The notification is displayed when the installation is finished. Once the extension is installed, you may read the tutorial to get started. Your system needs to have node.js installed (and set in PATH so you may node from terminal/command line) to run wallaby.js for VS Code, you may download and install node.js from node website. To get started, you need to install wallaby.js Atom package from your editor (Settings - Install). After the package is installed, wallaby.js Plugin and wallaby.js Core will be automatically downloaded and installed. The Atom package is just a loader/updater of wallaby.js Plugin and Core, it gets updated quite infrequently and does it the same way as all other Atom packages that you may have installed. Wallaby.js Plugin and wallaby.js Core on the other hand are updated more frequently, the update is performed automatically behind the scenes and the notification is displayed when the update is finished. Once the package is installed, you may read the tutorial to get started. Your system needs to have node.js installed (and set in PATH so you may node from terminal/command line) to run wallaby.js for Atom, you may download and install node.js from node website. If you have multiple versions of node.js installed or don’t have node path in your PATH, and you would like wallaby.js to run with a specific version (for example if you are using nvm), you may set process.env.WALLABY_NODE = 'your/nodejs/path/node' (full path to node.js executable file) in your Atom Init Script. Download wallaby.js VSIX from our website and install it in your Visual Studio. 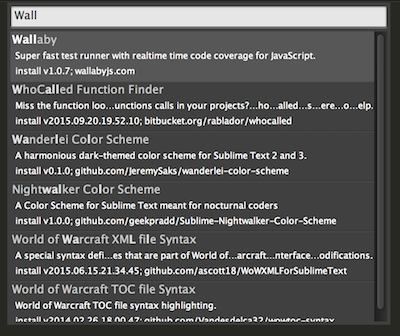 Once installed, wallaby.js may be managed like all other “Extensions and Updates”. After the plugin is installed, all updates are managed right from your Visual Studio. Wallaby.js will notify you when an update is available. To get started, you need to install wallaby.js Sublime Text package from your editor via the Package Manager (Package Control: Install Package command). After the package is installed and started for the first time, wallaby.js core and its dependencies will be automatically downloaded and installed. Your system needs to have node.js installed (and set in PATH so you may node from terminal/command line) to run wallaby.js for Sublime Text, you may download and install node.js from node website. If you have multiple versions of node.js installed or don’t have node path in your PATH, and you would like wallaby.js to run with a specific version (for example if you are using nvm), you may use node_path setting in your User/Wallaby.sublime-settings file to specify the full path to node.js executable file. If you are using GitGutter package for Sublime Text, please follow the instructions to make it not overwrite wallaby icons. Note that trial version of wallaby.js (the one without a valid license) will be displaying prompts and stopping after some time, so you will need to restart the tool or your editor. Please contact us if you would like to arrange a trial period for yourself or your team without activation prompts and restarts. © 2015- 2019 Wallaby.js. All rights reserved.